This past weekend Marty and I drove to Wilmington to watch and cheer people on in the Beach 2 Battleship Full and Half Irondistance races. It’s always a chilly start for this race, but each year gives way to a beautiful sunny afternoon. 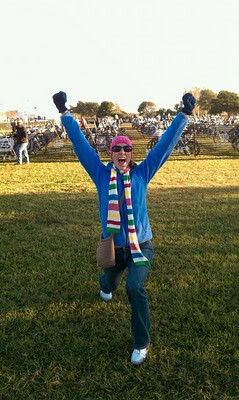 Here I am impersonating a cheerleader before the start. I don’t know, was I supposed to not put my hands in fists? Tickle the clouds as they say? I’m also not very symmetrical. Obviously, I was never a cheerleader. My sister and bro-in-law were in town for the UNC v Va Tech game so we got to hang out with them for a bit on Saturday night and Sunday morning. After they left, Marty and I went for a great bike ride – we’re close to a greenway that runs directly into Umstead so we did a big loop back to our house. The fall colors are absolutely gorgeous right now. I had to remember to watch where I was going and not stare at the trees the entire time. Even driving into work I have to stop myself from looking at all the pretty colors. The main interstate that runs through Raleigh-Durham-Chapel Hill is one big corridor of trees that have changed color. There aren’t any billboards so it’s really quite a nice drive into work. This is something that I don’t think a lot of people up here appreciate (the no billboards) but after living in Florida for so long where it’s ALL billboards, I try to be thankful for it – and hope that in the future the cities don’t decide that revenue from the billboards outweighs the trees. Thursday evening I’m flying up to NYC to meet up with my sister and mom. It’s my mom’s 60th birthday so we decided to celebrate in the Big Apple. We’re also going to the Notre Dame v Army game at Yankee Stadium on Saturday night (my family are big Notre Dame fans). I just hope we don’t freeze to death. i think you need jazz hands. I don't know viewing trees turning colors on the way to work, and spending time with the family. Doesn't sound like a boring entry to me. That's a fun pic - I've TOTALLY done that pose :)! I love the trees here. They are almost done but fall is one of my favorite times of year!! For some reason I can't access your blog from work so I'm getting caught up. I didn't know you went to UCF. Sooooo many people from my high school went there. For some reason I thought you went to Auburn. Random. Anyway, all your talk about fall in NC is making me crazy jealous. I am really over the midwest right now. I love how you say "up here", like we're in the northern hinterlands or something. Since so many people around here are relocated from the other direction, it's certainly a point of view you don't hear very often. Hope you're doing well and we should catch up sometime! !